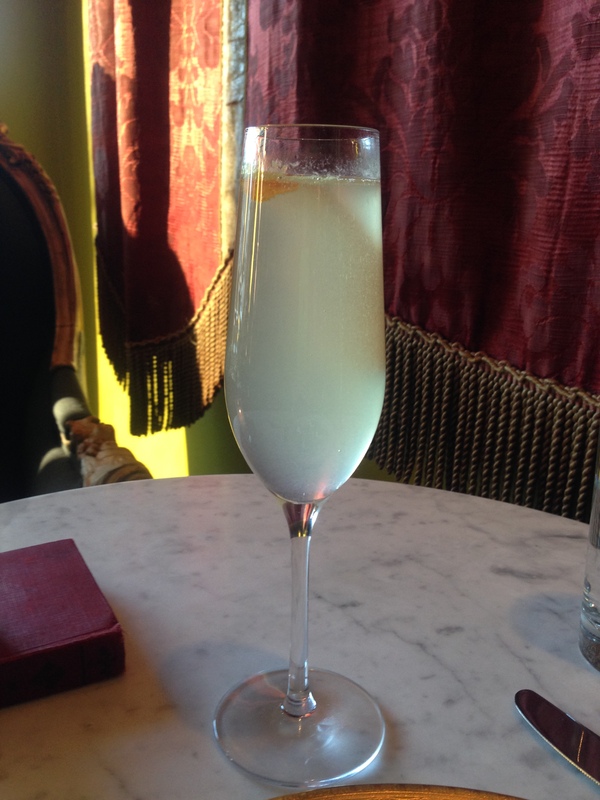 French 75 | Eat It, St. Louis! There’s this itty, bitty Frenchie destination nestled among the coffee shops, tailors, and frozen yogurt parlors on Wydown. The moment I step through the door – no matter how many times I visit – I’m transported to The City of Lights. The animated conversations swirl. The laughter rings. The efficient and familiar waiters flirt and attend. My heart flutters. While the rhythm of life intoxicates my soul, it’s the champagne cocktails and tasty bites that feed my senses at Bar Les Freres. Zoe Pidgeon’s fabulous French hideaway that’s right in plain sight mixes a perfect French75 that pairs deliciously with delicate blini. Oh, wait, what? You’ve not had a French75? I’m here to tell you, you should. And you should have it at Bar Les Freres. This lovely cocktail is an interesting and aromatic mix of champagne, gin, Grand Marnier, a dribble of lemon juice and a twist of orange. The French75 scared me a little at first. My history with gin is dubious – at best – but I’m becoming a convert slowly but surely. A French75 is simply heaven. Each sip is citrus-y with the devilishly bitter edge only gin can deliver. The champagne sparkles on my lips and sends bubbles up my nose. I urge you, though: don’t stop with the cocktail. 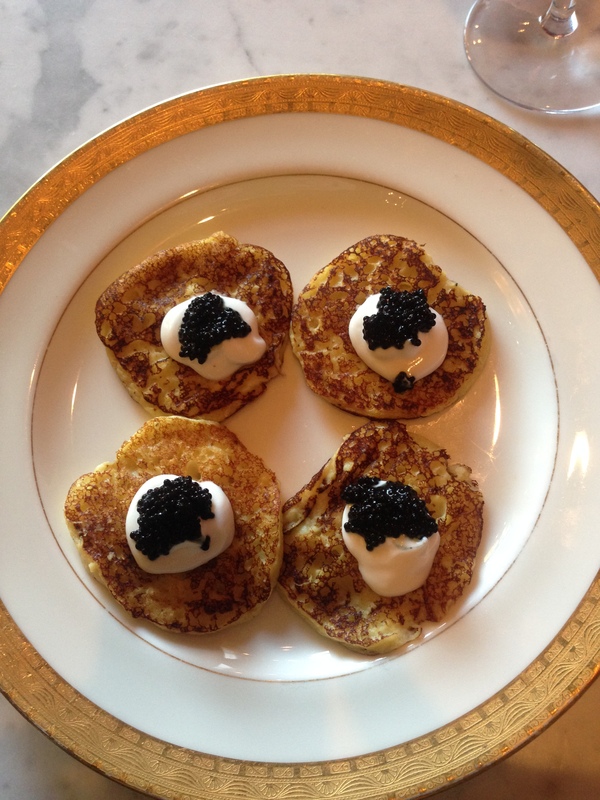 Indulge and have the bliss that are blini. When they arrive on a little gold-rimmed china plate, take a moment to appreciate their simple, elegant charm. At the base are thin potato pancakes about the size of a silver dollar. A dollop of sweetly tart crème fraiche sits on top and showcases a taste of caviar. Don’t waste your time with a fork and knife. Each blini is but a bite. Pick it up and pop it in your mouth. What happens next is pure magic. The pancake – which is made with mashed potato – melts away. The crème fraiche brings a little flavor punch to the party while the caviar – all briny and salty – bursts like fireworks. It’s true. When I have the blini, I clap and dance in my seat. That, my friends, is what joie de vivre is all about. Bar Les Freres is a magical place where the joy of living radiates from the buzz of the conversation, the hum of the bar and crescendo of the food. You leave infused with light and love and happiness. And when all else fails, put a little caviar on it and Eat It, St. Louis!